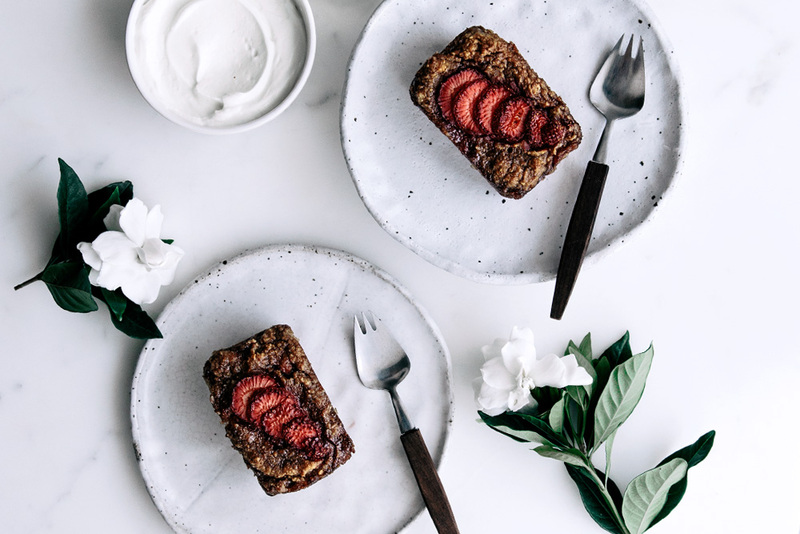 This week’s new recipe are these super cute and delicious vegan loaf cakes, full of some of my favourite flavours; fresh pear, strawberries and vanilla. It's the perfect recipe for those overripe pears you might have lying around that you don’t know what to do with. The pureed pears form the perfect base, and mixed with the pure maple syrup provide the natural sweetness for these little vegan cakes. I love baking with strawberries and have used them in today’s recipe. If you don’t have any on hand you could also use frozen raspberries. For those of you after a sweeter tasting cake, try adding some roughly chopped dark chocolate to the mixture. Yum! I have also used whole spelt flour because I love cooking with it. If you are gluten intolerant, a light buckwheat flour will work just as well, but may result in a slightly nuttier flavour. As always if you have any questions or just want to say hello, let me know in the comments below. I’d love to hear from you! Roughly chop the pears and blend with the maple syrup in a blender until smooth. Then pour into a large mixing bowl. Add the coconut oil, spelt flour, almond meal, vanilla, baking powder, fleur de sel and mix well. Next fold through the finely chopped strawberries. Lightly grease an 8 hole mini loaf pan (or a 12 hole muffin pan). Scoop the mixture evenly into the pan. Place the sliced strawberries on top of each little loaf and sprinkle generously with coconut sugar. Once cooked, remove from the oven and allow to cool slightly. Serve warm with coconut yoghurt or natural yoghurt and a little extra pure maple syrup. Enjoy! These Spiced Chocolate Gugelhopfs were inspired by an upcoming trip to Berlin. Cake anyone? Light and delicious honey sweetened lemon and olive oil vanilla cake!